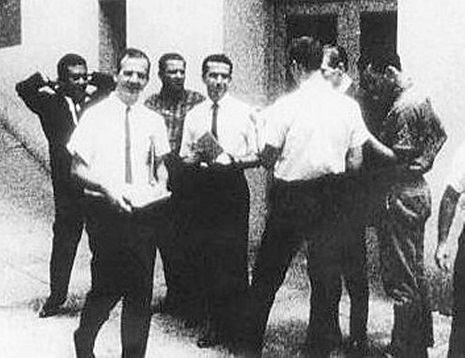 Lee Harvey Oswald, front left, standing next to man never identified by the Warren Commission, center in white shirt, handing out leaflets for the Fair Play for Cuba Committee taken outside the International Trade Mart in New Orleans on Aug.16, 1963. 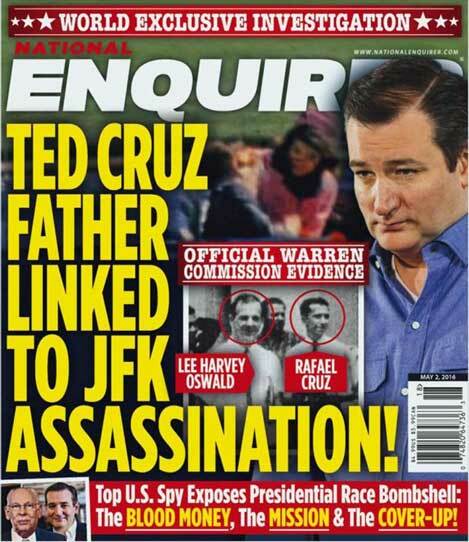 The National Enquirer is now saying that they have determined through photo analysis that the man is Rafael B. Cruz, father of GOP presidential candidate Ted Cruz. Daddy Bush was in Dallas during this time, as was Nixon. Anyone surprised by this (if true....)? Interesting. This shouldn't have any bearing on creepy Ted, or should it? SCREAMING HEADLINE NEWS: READ ALL ABOUT IT! Raggedyann wrote: Interesting. This shouldn't have any bearing on creepy Ted, or should it? The Next Step For Ted Cruz: Begging For Ballots? Giggling their way through a discussion about the possible collapse of the Never Trump movement on Monday's All In on MSNBC, host Chris Hayes turned to panelist, Esquire writer Charles Pierce, and predicted a Trump victory in Indiana with over 50 percent of the vote would be far more significant than any of the blowouts and the Northeastern states. Pierce agreed and acting like he's ultimate conservative whisperer, informed viewers that "[t]here's no reason to vote for the guy" joking that he "expect[s] to see Ted Cruz on a street corner outside Ft. Wayne with a sign saying, 'will debate for food.'"